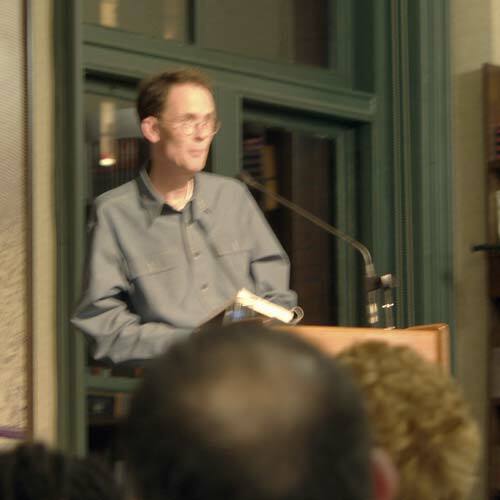 On Thursday (2004-02-20), William Gibson came to NYC to read from his newest novel, Pattern Recognition. Kip from work, who is a total WG fanatic, told me about it, so that morning, I grabbed the first WG book I could find and my camera. We got to Barnes & Noble at around 6:40, in time to get decent seats. Disappointingly, nobody in the crowd had mirrorshades, wire woven into their hair, or body armor. Oh, well. 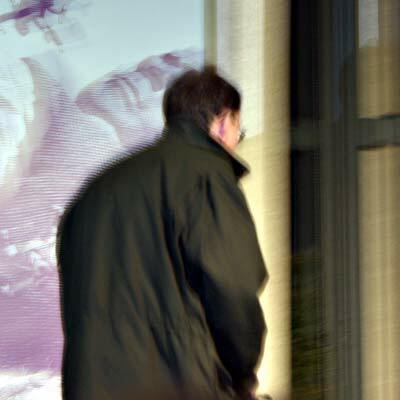 Shortly after 7, this tall, hunched, reedy man in a bulky overcoat shuffled in. 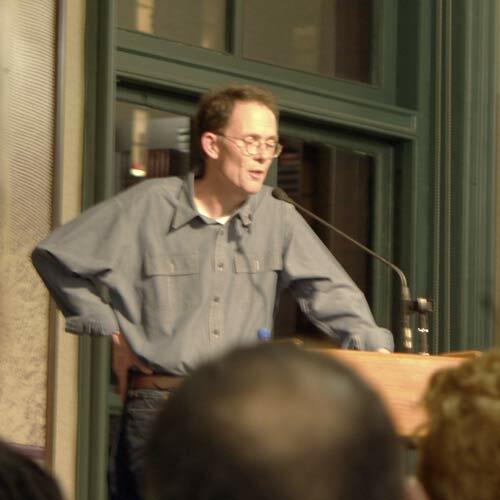 After a brief second of confusion, I recognized him as WG, himself, the Father of Cyberpunk. 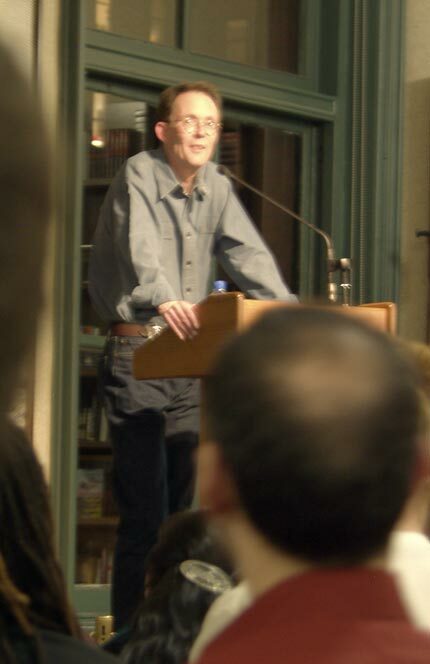 After a brief introduction by the B&N guy, WG came up to the podium. Fortunately, the mic boom was very adjustable, so it could reach his mouth. He stammered a bit about this and that, pausing briefly to gloat over his correct use of “penultimate” (this was his penultimate stop). He explained that he&apos;d been trying to read a different section every night, but that tonight he&apos;d just read chapter 1. He was quite obviously road-weary. As he started reading, he seemed to straighten up a bit. 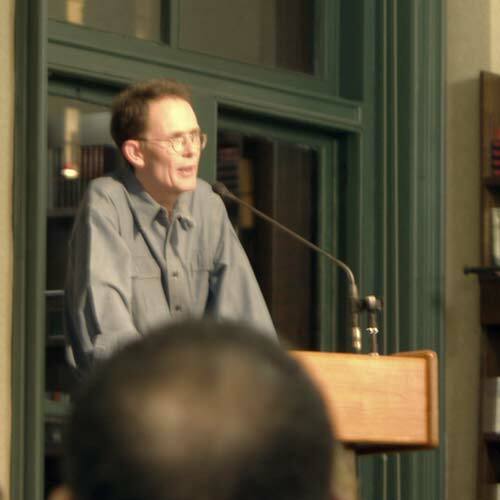 His voice is rather nasal (not that I could throw any stones here), but the rhythm of his reading matched well the prose. He was really reading, he stumbled here and there. The best part, though, was when he got to a passage that he liked, he would grin broadly, obviously pleased at his cleverness. The person next to me asked a question, and as WG looked over, I snapped a picture. He appears to think of himself as just a guy — he seemed surprised that people would want to take pictures of him. After the questions, he offered to sign people's books. 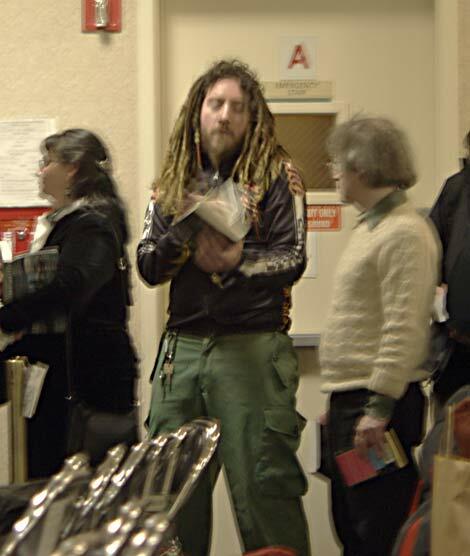 At that point, I finally discovered what appeared to be a Real Cyberpunk® in the crowd. I had lent out my reader&apos;s copy of Pattern Recognition, so B&N managed to get $15 out of me. Later that evening, the enormity of the situation struck Kip. 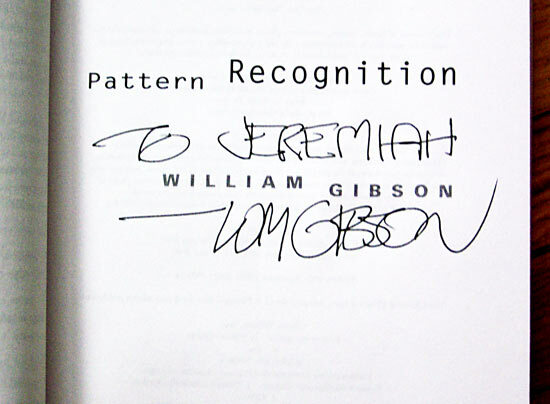 “William Gibson signed something I own,” was his mantra that evening, and for a while after we arrived at work on Friday. Sorry for the abysmal quality of the pictures, I forgot to set my camera to underexpose, so they all came out blurry.